Caballerizas Bikuña is a family business that has been working with horses for more than 20 years. In all this time we have created an own stud farm called Yeguada Calatañazor, with some of the best Spanish and Arab pure-breds. We have more than 50 horses including Spanish pure-breds, Arab pure-breds and crossbreds. Caballerizas Bikuña is located in a little village in the north of Spain called Bikuña placed close to a city called Vitoria. 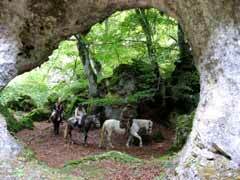 Caballerizas Bikuña is also located among the mountain ranges of Entzia, Urbasa and Urbia. Pure nature. These lovely landscapes around us make our riding-horse-excursions unforgetable experiences. If you like horses we encourage you to visit us and take a look to all the activities we do: Horseback trail riding, dressage, endurance racing, classes for all the riding levels and children camps are some of the activities we organize.